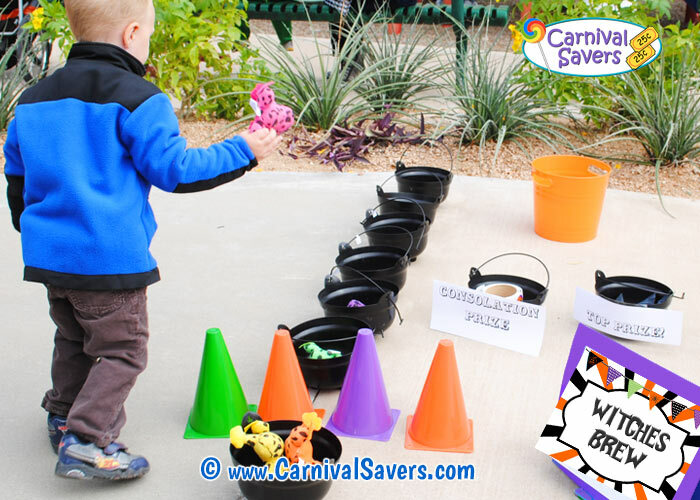 Halloween Carnival Game Idea - Witches Brew Carnival Game! Easy Setup and Fun for Kids - a Great Halloween Game! 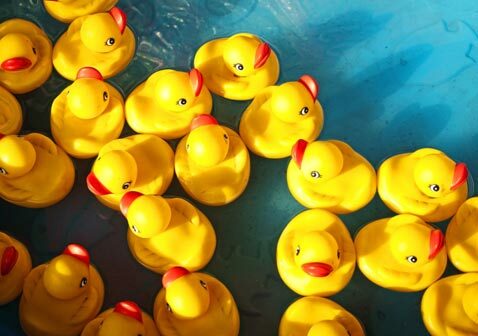 Kids Toss Stuffed Frogs or Bat Toys into Kettles. Plastic Cones or chalk to mark "stand behind lines"
Carnival Prizes - 4 - 6 different prizes of graduated value - Halloween themed prizes or fall prizes are great fun! Before your event, place the witch cauldrons in a line about 6 inches apart. Also, set up your stand behind line about a foot away from your first cauldron. 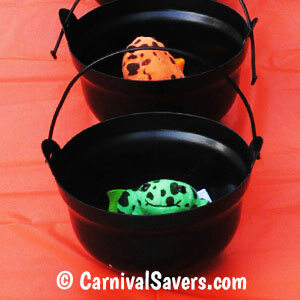 Players are given 6 stuffed frogs to toss into the witches cauldrons. The players try to toss a frog into the "witches brew" in order - starting with the closest to the farthest. Once a frog is in the "witches brew" they move to the next pot. There are two primary ways to have this game played for prizes. 2. Players can win prizes for each cauldron that has a frog or bat. Each Black Kettle is coordinated to a prize, and kids win a prize for each kettle. Sometimes kids want the top prize - so they use all their frogs or bats to try to get them into the last cauldron. So keep that in mind. Generally, the prizes start as consolation and then move up to the top prize for the last black kettle. Keep in mind that if you set up your game using this method, you will generally need many prizes for Kettles one two and three as these are won for most players. When purchasing prizes, make sure at least kettles #1 and #2 have consolation prizes so you do not loose money on this booth. Tip: For larger Halloween parties and Halloween Carnivals -- run two games at the same time! 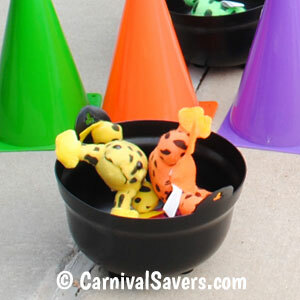 Also -- Use the extra Medium Sized Witches Cauldrons as Prize Buckets for this and other carnival games too! SUPPLIES & PRIZES for the WITCHES BREW HALLOWEEN CARNIVAL GAME!